Take Advantage of Our Special Student Subscription Rate! 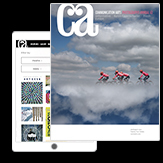 For only $39, you get: Print and PDF editions of the Design, Advertising, Illustration, Photography, Interactive and Typography Annuals + unlimited access to the Commarts website. All at a savings of *73% off the newsstand price! This offer is available in the United States only. Let your Instructor know how to join the Communication Arts Student Subscription program.